Letter from Baptist minister S.F. Conrad asking Martha Berry for information about the Mt. Berry Schools on behalf of possible interested parents. References to Mr. and Mrs. Henry Ford making a donation of 1 million dollars to the Mt. Berry School. 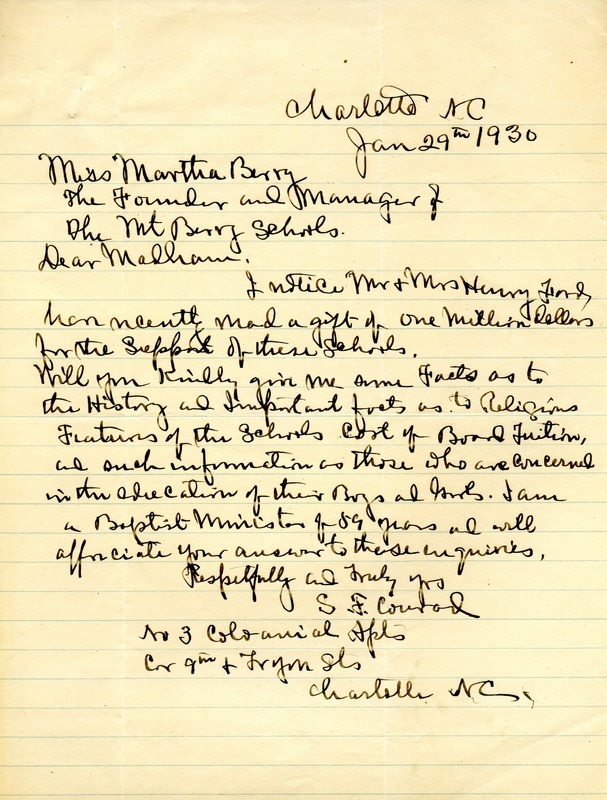 S. F. Conrad, “Letter to Martha Berry from S. F. Conrad.” Martha Berry Digital Archive. Eds. Schlitz, Stephanie A., Chelsea Risley, Garrick Bodine, et al. Mount Berry: Berry College, 2013. accessed April 22, 2019, https://mbda.berry.edu/items/show/12168.